I admit, I've been a little neglectful lately of my OllieOllieToxinFree friends. It's not been intentional, but I've been busier than usual at home and at work. Yesterday, I renewed my URL (which I'd let lapse and thankfully no one had snapped up) and bought three years of hosting from GreenGeeks.com. If I'm going to do this, I'm going to make it legit. Stay tuned, for a new look (most likely, since I won't have this template) and the new live URL. Please keep sending me ideas for topics and thanks for all the support to date! One post that caught my eye so far this year was on Inhabitots, a favorite blog. 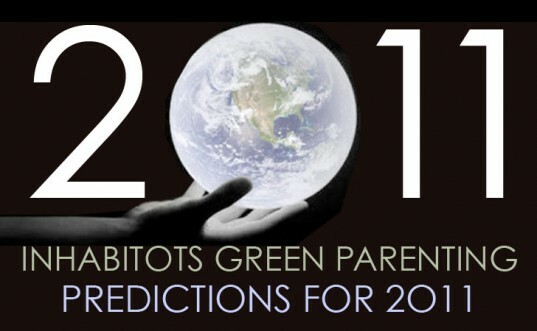 They asked folks in their green network to make predictions for 2011. The panel consisted of Inhabitots founder Jill Fehrenbacher; Danielle Friedland, Healthy Child Healthy World; Natalie Zee Drieu, CRAFTZINE; Micaela Preston, Mindful Momma founder; Nick and Kimber Christensen, Little Sapling Toys designers; Mari Richards, Small and Big founder; and Jennifer Chait, Growing a Green Family founder. "...more parents will get turned on to the importance of simple, unprocessed food and toxin-free toys for their children, and this consumer demand will finally lead to major change in manufacturing processes." "We'll be demanding greener products. We'll be advocating for better school lunches. We'll be rallying against unsafe chemicals." "...eco-friendly, less toxic art supplies will be more plentiful and more varied." 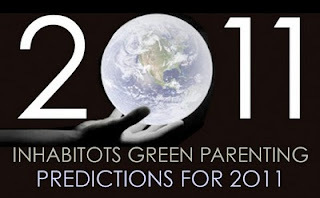 "2011 is going to be the year we see a shift in parenting values. Values that say it's okay for parents to ease up a bit and allow kids to be kids." I agree that consumer consciousness is growing, which should mean demand will keep growing. People are starting to think more about what's in their food, in their personal care products and in the air they breathe. Credit is due to movies (Food Inc., King Korn); people (Michael Pollan, Jamie Oliver, Alice Waters, Michelle Obama); grassroots movements (the Slow Food Movement, Edible Schoolyards), research organizations (Healthy Child Healthy World, Environmental Working Group) and the media's willingness to cover these topics. I think we will see non-toxic products become more mainstream as we find out more about BPA, phthlalates and other neurotoxins and endocrine disruptors. People will continue to spend more of their dollars on healthier products, and the market will keep shifting to meet demand. This will be a slow process, though, nothing breakthrough this year. Unfortunately, I think we're also going to see more research proving the link between toxic chemicals and illnesses, from cancer to autism to diabetes. I've already seen some incredibly disturbing studies; this might be the year for the smoking gun.